This was my first ever attempt at making ribs. They were so good! They may looked burned from the picture, but they aren't. 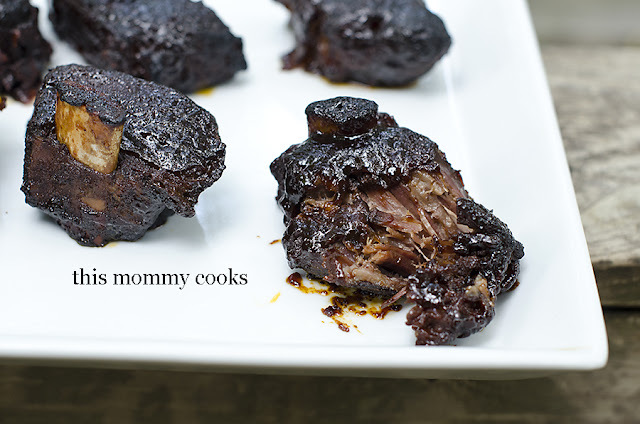 I had always been intrigued by making them in the slow cooker, and finally I tried it out. There is an additional step of broiling them, but it really didn't take that long. My husband loved these and I am no longer intimidated by making ribs. You could use this recipe for pork or beef, I chose to use beef. I also forgot to add the barbecue sauce in the beginning, I added it about 4 hours later, and they still turned out great. Enjoy! In a small bowl, combine paprika, brown sugar, cayenne, salt, and pepper. Rub this mixture over both sides of your ribs well. Arrange ribs in the slow cooker by standing them up against the wall of the stoneware pot, thicker side down and meaty side against the pot. Pour barbecue sauce over the ribs, cover and cook for 6-8 hours on low (I actually forgot to put the barbecue sauce on and cooked them for about 4 hours before adding it, they were fine.). Once the initial slow cooking is done, prepare a baking sheet with foil and place a rack (like a cooling rack) on top of it. Very carefully remove the ribs to the prepared baking pan, bone side up. Set aside. Skim any fat that has risen to the top and strain all of the remaining juices from the slow cooker through a mesh strainer into a small saucepan. Bring to boil and allow to simmer and reduce by about a third, about 15 minutes. Preheat your oven's broiler and make sure the oven rack about 10 inches below the broiler element. When the broiler is preheated, brush the ribs with sauce and broil for 3 or 4 minutes. Remove ribs and carefully flip them over, brush with sauce and broil again, meat side up, for approximately 9 minutes, taking them out once or twice to baste with more sauce.